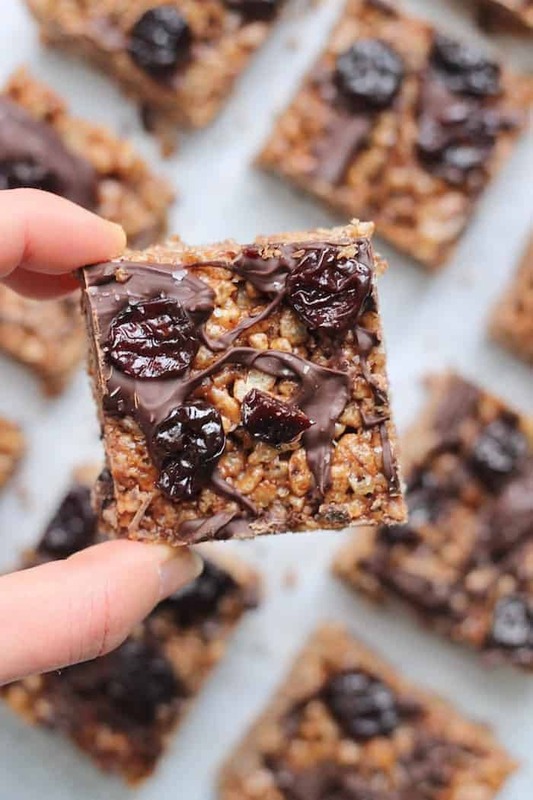 These easy Chocolate Covered Tart Cherry Rice Crispy Treats are a delicious, wholesome dessert made with almond butter and sweetened with honey! Recipe in partnership with The Cherry Marketing Institute. 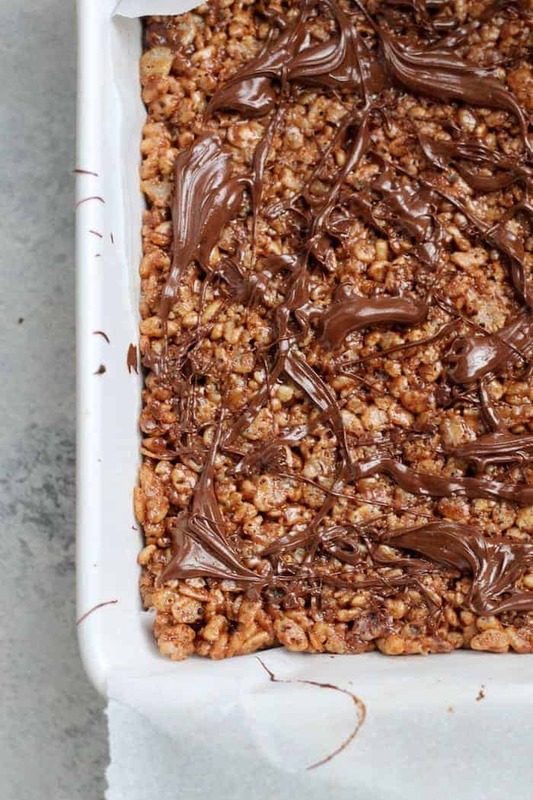 There is a level of textural heavenliness that can only be achieved by rice crispy treats. Crisp, chewy, sweet, just enough crunch…what more could those taste buds of yours possibly need? My favorite thing about this super fun Chocolate Covered Tart Cherry Rice Crispy Treats recipe is that they’re so darn easy. And you don’t have to bake them. And they’re perfect for you and your hunny (or just you, do your thang!) to munch on this Valentine’s Day. Aand they only have seven ingredients. How many things was that? This easy homemade rice crispy treat recipe is also completely kid-friendly in that the little ones will love not just eating these bars of glory, but helping to make them, too!They were inspired by these Peppermint Rice Crispy Treats from last year. Have you made them? So delish! I’m so pumped to be partnering with The Cherry Marketing Institute on a series of recipes this year featuring Montmorency tart cherries. Also known as sour cherries, Montmorency tart cherries are available year round in dried, juice, juice concentrate, frozen, and canned forms. Did you know the tart taste and gorgeous ruby red color comes from the anthocyanins inside? Those flavonoids are also to thank for health-promoting properties like helping reduce muscle soreness, ease arthritis pain by reducing inflammation, and supporting heart and digestive health. I freaking love it! Perhaps the most beloved health-promoting property of Montmorency tart cherries is that they contain melatonin, a natural hormone that helps regulate sleep. That’s right—we’ve got the most yummy bedtime snack on the planet for ya right here! Montmorency tart cherries are grown primarily in seven U.S states including Michigan, Utah, Washington, New York, Wisconsin, Pennsylvania, and Oregon. I encourage you to support local agriculture and preserve generations of US family farms by steering clear of imported cherries. 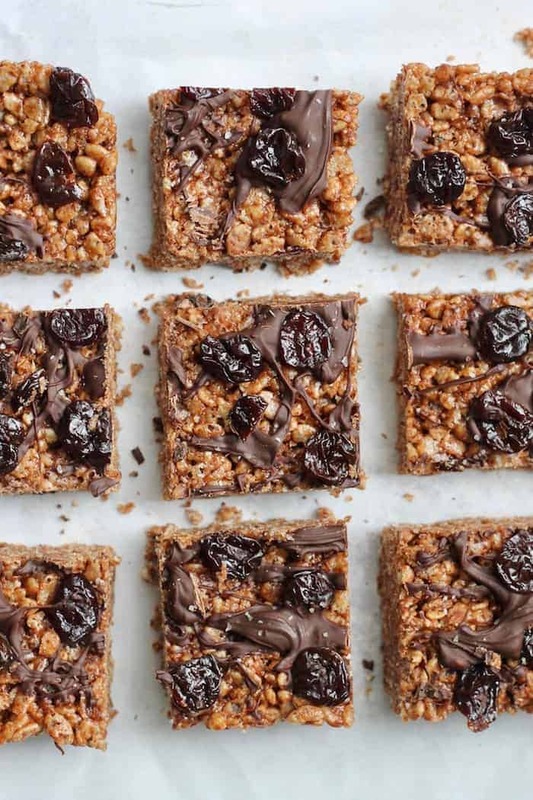 With all the extra tart cherries you’ll have on hand after making these rice crispy treats, you can enjoy the unique flavor and potential health benefits of nature’s very own sweet tart as a toast topper, with oatmeal, on yogurt, or all by their lonesome. 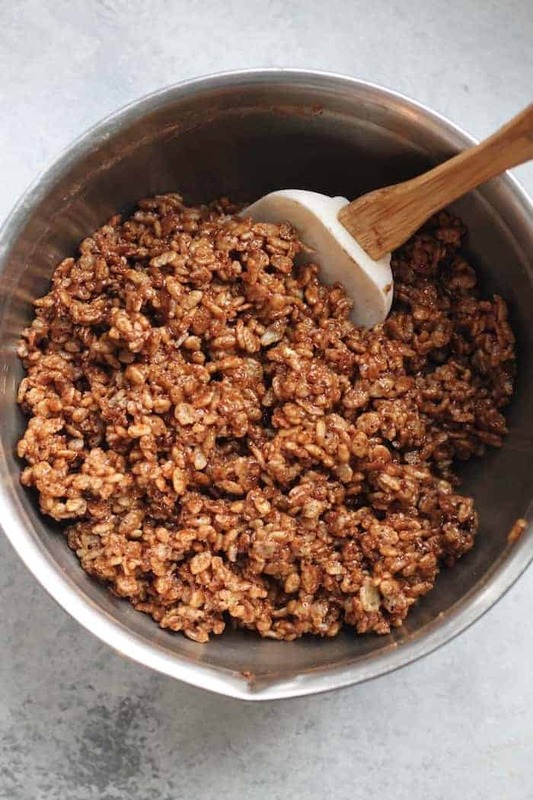 When it comes to this rice crispy treats recipe, you can use any crispy rice cereal you fancy (white or brown rice), just not puffed rice. 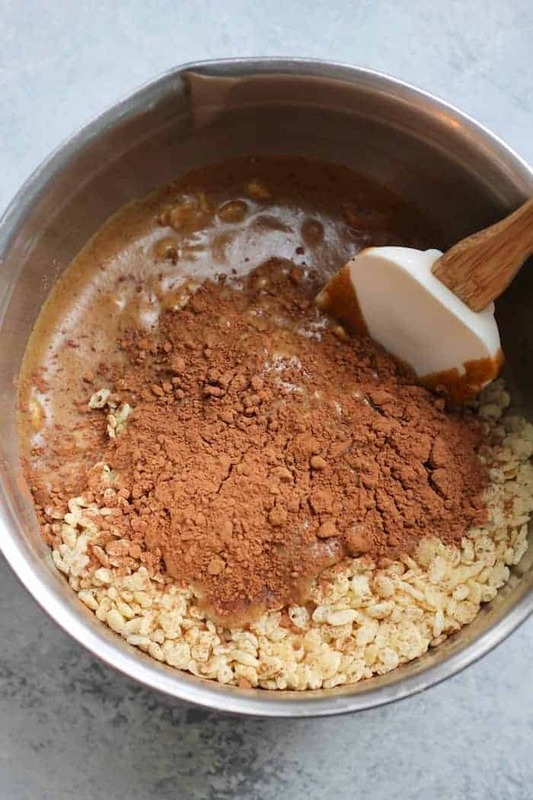 Make sure your almond butter is the kind that’s nice and drippy versus hard so the mixture comes together nicely. I love honey here because it helps these treats stick together (the boiling step is critical). I haven’t tried them with maple syrup so try at your own risk! This recipe comes together in a cinch. 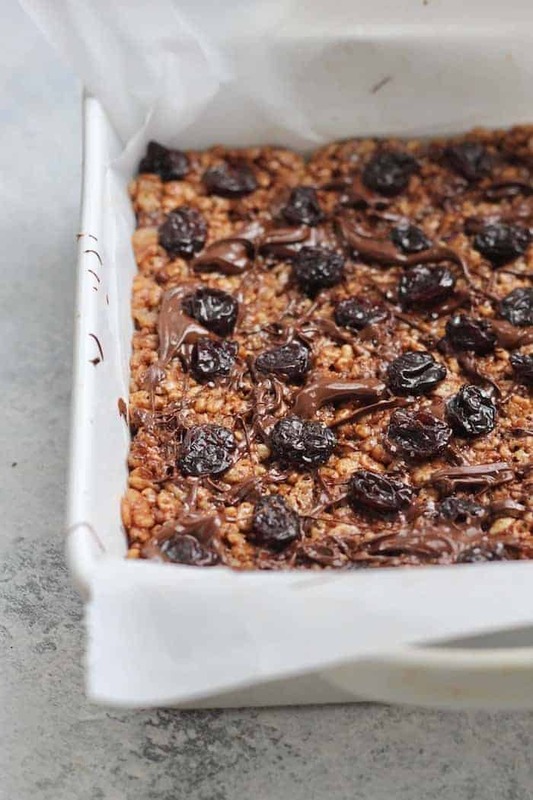 Simply mix the boiled honey and almond butter mixture with the rice cereal and cocoa powder (I like to add extra tart cherries to the mix! ), press the mixture reeeeeeal well into the lined pan, drizzle with melty chocolate and tart cherries, and freeze. Slice. Eat. Repeat. Now let’s get cooking. There’s chocolate to be devoured! These easy Chocolate Covered Tart Cherry Rice Crispy Treats are a delicious, wholesome dessert made with almond butter and sweetened with honey! Rice krispie squares are so nostalgic! Love the addition of chocolate + cherries! Thanks for taking the time to create a unique recipe, along with carefully-chosen commentary and gorgeous photography. :) Keep it up, girl. Do these have the same trademark chewy texture of the treat we’ve all come to love? I know this is a “clean” spin on a classic, but I’m not willing to sacrifice the buttery, soft goodness fluff lends itself to. Readers? Any thoughts on this? Thanks, guys . Hey gurl! :) <3 I love your passion for a good ole rice krispy treat lol. I made these literally as soon as they were posted–I'm PMSING super bad and was like CHOCOLAAATE haha. They're awesome, a great texture, and the honey makes them slightly chewy I'd say, but for me at least, they weren't an exact replica of the "treat we've all come to love," as you say. But you gotta weigh the + and — these are wholesome, so it might just be worth it. Really tasty! I subbed peanut butter and they filling tasted like a no-bake cookie. I have been eating them straight from the freezer. My didn’t cut cleanly and sort of broke apart but I think that is because I used a thicker peanut butter instead of almond butter. Maybe add a touch more honey for extra stickiness if that’s all you have? Would definitely make again! Thanks for the recipe. Where can I buy these cherries in the Columbus area? And are they a dried version in this recipe? Thanks you so much for sharing this recipe. 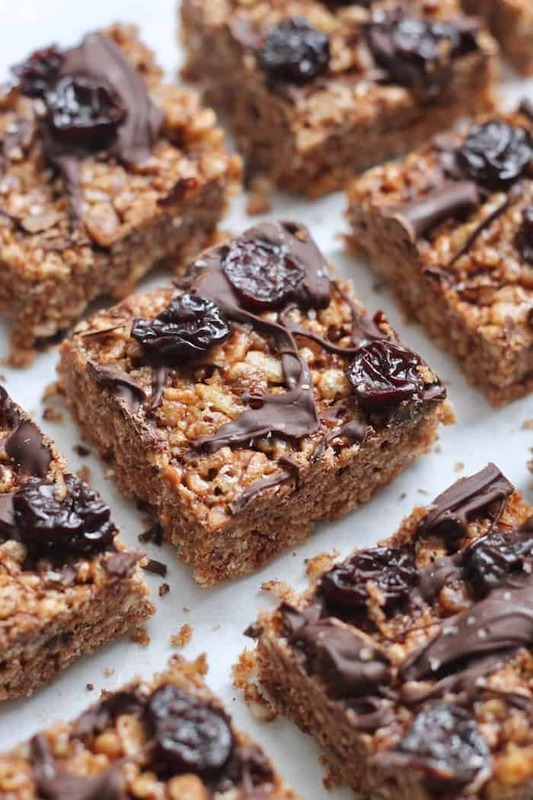 these chocolate tart cherry rice crispy treats look amazing and the way you expresses it also very good. but if while working on any dishes and your kitchen appliances broke down? no need to worry just make a call at Geek Squad and you will be assist with the best possible solution. Geek Squad is an technical assistance group in USA and UK. they have a team of more than 20,000 well trained professionals who are experts in all sorts of technology. So if you need any help regarding your electronic gadgets and appliance you can contact to Geek Squad.